1 460,47 € tax incl. 1 207,00 € tax excl. 2 516,80 € tax incl. 2 080,00 € tax excl. Power: 1 HP A 220 V. SINGLE PHASE.OF AUTOMATIC OPERATION.VELOCITY VARIATORDimensions: 380 X 930 X 1530 MM.Capacity:IT HAS A 15 KGS HOPPER. 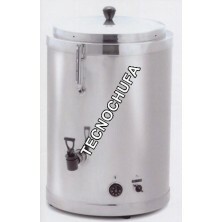 CAPACITY.Others:SPECIAL TO ELABORATE CHURRO DE RUEDA.Notes:CONSTRUCTION IN STAINLESS STEEL 18/8 ..
1 161,60 € tax incl. Operation: Manual Dimensions: 730 x 300 x 560 MM.Weight:25 kgCapacity:3 KG of dough.Other: CEILING SUPPORTNotes: Construction in chromed steel and stainless steel. 2 855,60 € tax incl. 2 360,00 € tax excl. 2 371,60 € tax incl. 1 960,00 € tax excl. We use own and third-party cookies to improve our services and show you advertising related to their preferences by analyzing their browsing habits. If you continue browsing, we consider that it accepts its use. You can change the settings or further information 'HERE'.